The only opportunity to obtain the full-size canvas reproduction of this painting, individually signed and numbered in paint by the artist. Size when stretched: 38" x 22". 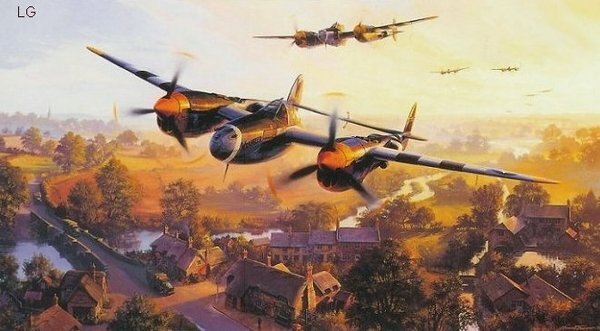 This beautiful image shows P-38 Lightnings of the 20th Fighter Group climbing out from their base in Kingscliffe, Northamptonshire. They leave at dawn on a low level strike mission - . their target - The Normandy beaches. This print is classic Nicolas Trudgian - with the wonderfully detailed English village below. U.S. Army trucks trundle through the village and add to the crescendo of noise made by the overhead P-38's - waking the whole village. You see the British pub - where the pilots would gather in the evening - surrounded by quaint English cottages lining a winding country lane.